No one is forced to have a ‘spiritual life’. As with all things granted by God, we have a choice whether we explore the mysterious non-material aspect of ourselves. Free will means each soul decides whether they want to develop spiritually. However one fact remains; whether you choose to explore your spiritual nature or not, it exists. Beyond the body, beyond the mind and emotions we all have an eternal part called the soul. If you wish to have a greater awareness of your own soul and its nature, meditation is essential. And even just pursuing meditation such as Mindfulness or some kind of breath-centric meditation may do little to open up the spiritual world to you. In order to reach the consciousness of your soul, your meditation practice will need to be specifically focused in that direction. In seeking a meditation teacher or a spiritual path, we feel that one of the most important criteria to look for is first… is meditation emphasized as a key component? And second, does the meditation style presented focus on developing soul consciousness and ultimately Self Realization? Mystics, meaning people who seek to experience a personal relationship with God inwardly, have long reported the existence of ‘the still, small voice within’. This is the voice of the Self, also referred to as the God Self or the Christ. The intention of anyone following the mystical path is to seek out and find the Self within. This is possible through meditation! Meditation is the act of directing your consciousness, through the discipline of mind and emotions, to whatever area of interest you choose. It is possible if you choose to focus on breathing deeply and stilling the mind, that your meditation practice will grow very strong in those two things; breathing deeply and stilling the mind. If you pursue Transcendental Meditation , your focus is on the inner repetition of a specific mantra (as given to you by a teacher). Over time, you will become more and more proficient in being able to transcend the monkey mind patterns of thought and hold your attention on your mantra. These are excellent practices and they provide the correct discipline to take your consciousness into more spiritual realms. We have found though that you have to be guided into the spiritual realms and that they rarely just appear on their own. In order to find the Self, or the inner Christ (what Jesus spoke of as ‘the Kingdom of Heaven’) you will first need to have some discipline over your mind and emotions. In our current society, the mind is revered as the center point of a person’s life and achievements. We think that the mind, when thought of this way is an obstacle to spiritual development. Thinking that being brilliant is one way the ego gets inflated. Instead, we seek to train the mind to listen for the inner voice of Truth, the still small voice of the God Self. Meditation is the best way to get there. While in some cases, a soul will have spontaneous spiritual experiences such as personal revelations through dreams, premonitions of future events, visitations from spiritual figures such as saints, or even Jesus himself, these experiences are rare. It is better to begin practicing meditation for in so doing, you are guaranteed to reach your destination, that of finding God within. The only caveat is that you must persist! Jesus stated that the narrow road leads to freedom and that few decide to take it. You can think of this narrow road as the one that includes daily meditation. And more specifically, a style of meditation that leads you to Christ. 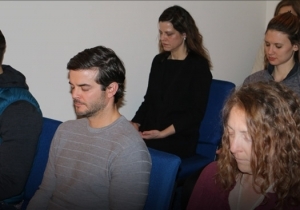 In The Mystical Church of Christ, meditation is encouraged as a daily practice. By attending weekday Communions and Sunday Service, you are guaranteed a 30 minute silent meditation each time. We offer a quiet and peaceful atmosphere that may not be possible in your home or apartment. And doing so in the company of other seekers is a great help! In addition, attendance at Bible Contemplation stirs up new insights and gives students inspiration to go deeper in meditation to find the answers they seek. The Gospels highlight Jesus’ life and His teachings. Contained in His story is the road map to finding the Kingdom of God. Jesus Himself said the Kingdom is within you. Through meditation, you can find it!